The feedercam is back now. I have ordered a stronger zoom lens for the camera and should have that installed in the next week or so. Right now the camera is too far away from the feeder to see the birds. If the zoom works as well, we will be getting back to the up close views similar to the old setup. We also have 5 Eastern Bluebird eggs in the nestbox. Thanks for visiting, Susan and Jim. Hopefully we will have a box of eggs in the near future. My sister-in-law already has eggs in her nestbox. 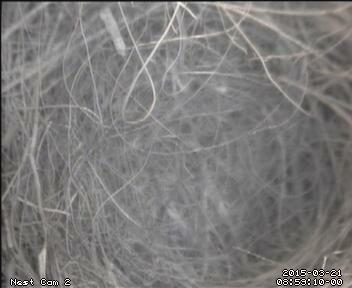 We are getting closer to getting the feedercam back on line. I figured out a way to route the wire so I could reuse the old camera. I priced a number of wireless cameras and realized that I would have to spend at least $200 to get one that is reliable and could be mounted outside and not be affected by the weather. Hoping to have this all working within a month. Thanks for visiting, Susan and Jim. Still working on getting the feedercam back up on the site. Since the camera is being moved off the deck and out into the yard, wiring becomes more of an issue. I am trying to reuse the old camera, however I may have to purchase an outdoor wireless to make the process easier and faster. I have at least got the feeder the camera will be focused on up. It is a larger tray feeder than was previously used. The first visitor was a Tufted Titmouse. Thanks for visiting, Susan and Jim.